Over the years I’ve been contacted by a few different people interested in licensing one of my illustrations for a tattoo. 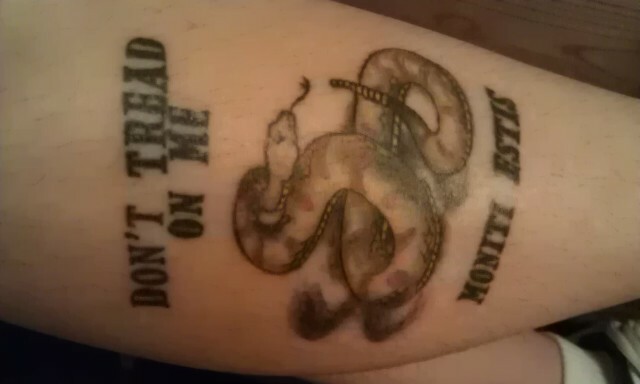 Most recently, John Conn, an Air Traffic Controller for the United States Air Force, wanted to incorporate my illustration of a timber rattlesnake into his “Don’t Tread on Me” tattoo (on his calf). Several years ago, a woman licensed my pen-and-ink blastoid illustration for an arm tattoo. Kat Marie Moya inked the tattoo. It makes me happy when folks like my illustrations enough to wear one on their skin! You are a very talented artist Emily. I’ve actually told a few of my friends about your website after they remarked how much they like the tattoo. Thanks again! You’re welcome, John, and thank you. Submit them to Carl Zimmer’s Science Tattoo Emporium! Great suggestion, Glendon; thanks. I’ve been to that website before and had fun browsing.